By the halfway stage of the 39-year-old contest the winner is often well ahead of the rest of the fleet, but at the start of Leg 5 to Itajai in Brazil Spanish leader Team Telefonica boasts a slender 15-point advantage. we’ve had one edition… where we still simply don’t know how it’s going to be settled by this stage,” said team Sanya skipper Mike Sanderson, 2005-06 winner. Sanderson proved his point yesterday by guiding Sanya, last in the standings, out of Auckland harbor first after an hour’s superb navigation around an in-port course. They led marginally from Abu Dhabi, Puma and Telefonica. He will not have long to rest on his laurels as the fleet heads 6,705 nautical miles towards their eventual destination to Itajai in Brazil via the Southern Ocean and then Cape Horn on the tip of South America. Race HQ in Spain yesterday delivered a weather warning to the fleet with a huge storm expected to hit it within a day. Waves of up to eight meters are expected. Sanderson will not be alone in worrying about his boat which has already been forced to suspend racing to effect bow and rigging repairs. Abu Dhabi was earlier forced to fix a crack in its rigging Friday while Groupama, Leg 4 winner, spent much of the week repairing a large hole in their bow which could have sunk the boat 100 miles from Auckland. Neal McDonald, a sailor on overall leaders Team Telefonica competing in his sixth race, said the trip to South America still had the potential to frighten even the most experienced campaigner. Storms claimed their first victim of leg five of the Volvo Ocean Race with the Abu Dhabi crew forced to return to harbor after their boat was damaged smashing into a steep wave yesterday. 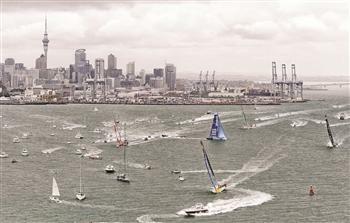 The six skippers had steeled themselves for a 36-hour battering as they left Auckland at the mid-point of a race that remains too close to call. But it was a disastrous day for Abu Dhabi, with skipper Ian Walker forced to suspend racing around six hours of leaving port after the bulkhead serving a major sail broke free. The team, currently fifth in professional sailing’s toughest test, expect to spend a day fixing the problem.